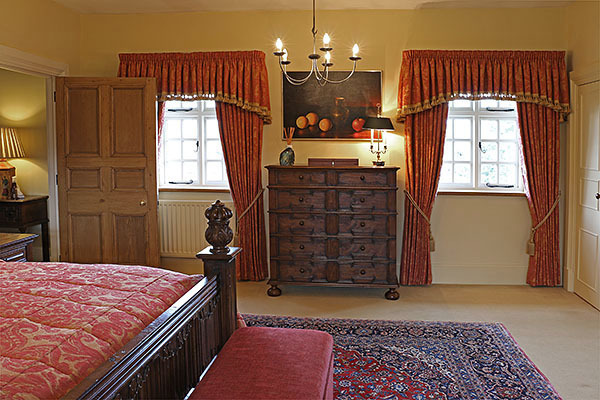 Oak Jacobean style chest of drawers, with cushion mouldings, shown here in our clients lovely Warwickshire country house. We actually made two of these. A 'his' and 'hers', both custom made to fit into specific locations. 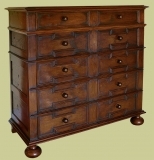 Click: Large 10-drawer chest of drawers in country house bedroom. At our clients request, we incorporated 21st century self-closing ball-race type drawer runners (the type you get on very up-market kitchen units). You'd never know looking at this photograph! Click on the product photo below, to find out more.